This spacious two-bedroom, two-bath condo is located in a historic boutique building with East River views from both the living room and master bedroom. Designed by renowned architects Clinton & Russell in 1904, beautiful 1 Wall Street Court is known as a look-alike of the iconic Flatiron Building. Perched on the 10th floor, the homes main living area features strip hardwood floors and two oversized windows with custom wood Venetian blinds. Open pass-through kitchen with walnut-finished cabinetry, stainless steel appliances including built-in microwave and dishwasher, granite countertops and porcelain subway tile backsplash and accent wall. Both sleek baths are outfitted with custom walnut vanities, freestanding over-counter porcelain sinks, striking Gioia marble walls and glass shower doors. Convenient in-unit stackable washer and dryer - and both bedrooms feature blackout shades and custom-designed California-style closet systems. Full-service building amenities include a 24-hour doorman, concierge and residents laundry facilities. The buildings spectacular sky terrace and roof lounge is a true indoor-outdoor space with movable glass paneled walls, flat screen TV and wet bar great to entertain guests. The roof deck provides panoramic views of the famous Downtown Manhattan skyline. Just south of Wall Street, the apartment is convenient to nearly every MTA subway line at the Fulton Center as well as NJ Path trains in the breathtaking Oculus. Shopping and dining opportunities abound in New Yorks historic heart. Relax in Battery Park overlooking Lady Liberty or spend the afternoon at the sidewalk bars and cafes of quaint Stone Street or the South Street Seaport. 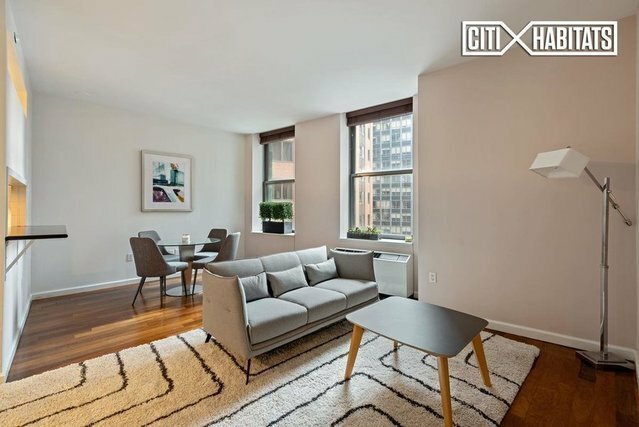 Situated where New Yorks past and present meet, this home is perfect for those who want all the best Manhattan has to offer. Act now to make this very special residence your personal home base in the Big Apple.